From Bryan Talbot, who just released the second chapter of his Steampunk, 'funny animal', Holmesian mystery adventure 'Grandville Mon Amour', which I'll be reviewing soon. 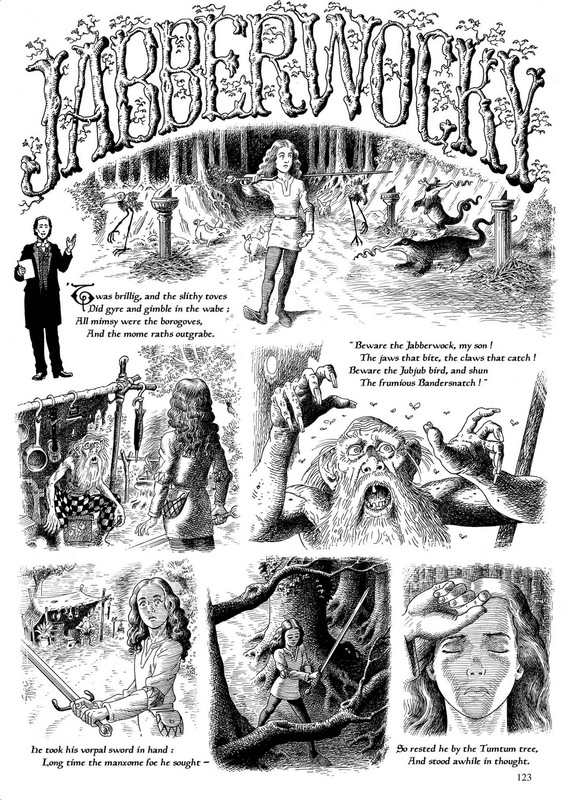 This delightful interpretation of Jabberwocky by Lewis Carrol comes from Alice in Sunderland, a compulsively fascinating work of geographical history merged with fiction much like Alan Moore's experiments in From Hell and Voice of Fire to create a four dimensional architecture to a sense of place. Moore did it in From Hell to London and with his home town of Northampton in Voice of Fire, Talbot does it for his hometown of Sunderland with a special emphasis on Sunderland native son Lewis Carrol. And here's Terry Gilliam's take, a grittier, more medieval interpretation. It's long, but try to stick with it to the introduction of the Jabberwocky himself, the giant puppetry prototypes of the practical effect monstrosities of Gilliam's dystopian classic Brazil. I know that by every objective standard the flashy CGI Jabberwocky of Tim Burton's Alice is more impressive but this creaky giant puppet made of wood and fabric fills me with joy.